How is it made? Layer upon layer of pork lard pieces are placed in a marble tub and each layer is liberally sprinkled with dry salt, pepper, rosemary, garlic, and cinnamon. The lard is then left to ripen for between six months and two years. The marble causes the connective tissue to break down, making the lard even softer. 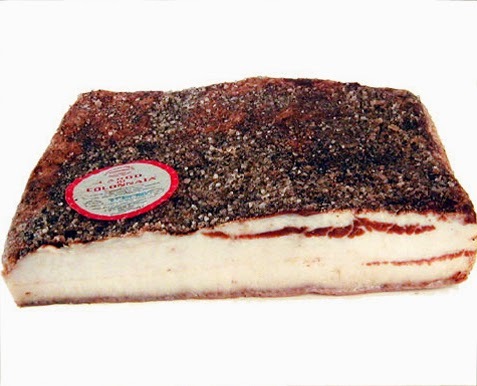 The extent to which the lardo is ready is determined by sight. The salt ensures the moisture is extracted whilst also drawing in the flavours of the herbs and spices. By reducing the moisture content and increasing the amount of salt, the lardo can be kept for longer periods.